At the start of the next week we will be seeing a new event called C.E.S ( consumer Electronics Show) in Las Vegas, Nevada. C.E.S is an technology event where every single company related to Gadgets, Computers, Accessories and much more will show off their new innovations and their products at this event. We will be seeing many new things on this event. We might also come across things which will be used in the next Generation Apple’s iDevice. Previously we told you about Toshiba, that they will be showing off the worlds thinnest and lightest tablet and ultrabook at this upcoming C.E.S. They might bring something big enough to compete with Apple’s product. Any how, every one who tried to compete with Apple didn’t crossed them yet. No doubt that Apple has changed the way that people used to use their computers. Apple came up with many new and innovative ideas regarding their computer technology side. Apple moved everything from wire to wireless. Today every Apple’s product used in computing sector is wireless or equipped with Bluetooth Technology which makes it easy to use for people. Apple no doubt made the life easier of many people by introducing innovative products, but they some how missed to keep the environment green and less expensive. If you are MAC user, so you must be aware of the Apple’s Magic Mouse, Track Pad, and Keyboard. These things uses the A4 size batteries which are to replaced at a certain point. We can assume that one replaces the batteries 5-6 times or less in a month. To make all things easy and user friendly, Mobee Technology, came up with a perfect solution for these things. Mobee Technology got numerous products for your MAC. The products includes, The magic Charger, The Magic Bar, The Magic Feet, The Power Bar, and The Magic Num Pad. Every single product got their own specifications and advantages. These above mentioned products are user friendly and allows the user to charge their accessories wirelessly. The best product among all of these is The Magic Bar. The Magic Bar is a complete set which lets you charge your batteries in your Mouse, keyboard and etc. With this Magic Bar you can charge everything simultaneously without any interruption. It can charge three accessories simultaneously, with just 6 hours of time span for full charge. You can see the video demo below. MOBEE TECHNOLOGY INTRODUCES THE MAGIC FEET AT 2012 CONSUMER ELECTRONICS SHOW IN LAS VEGAS, NEVADA. MOBEE TECHNOLOGY, A SWISS-BASED COMPANY WITH OFFICES IN CALIFORNIA OFFERS A NEW, WIRELESS RE-CHARGING SOLUTION FOR THE APPLE WIRELESS KEYBOARD, APPLE MAGIC TRACKPAD AND APPLE MAGIC MOUSE THAT ELIMINATES THE NEED TO THROW AWAY DISPOSABLE BATTERIES. THE MO4212 MAGIC FEET REPLACES THE 2-AA BATTERIES THAT POWER THE APPLE WIRELESS KEYBOARD OR THE APPLE MAGIC TRACKPAD WITH A CYLINDRICAL BATTER PACK THAT WEIGHS ONLY 1.34oz/38g. IT REPLACES THE 2-AA BATTERIES THAT POWER THE APPLE MAGIC MOUSE WITH A BATTERY PACK THAT WEIGHS ONLY 1.30oz/37g. 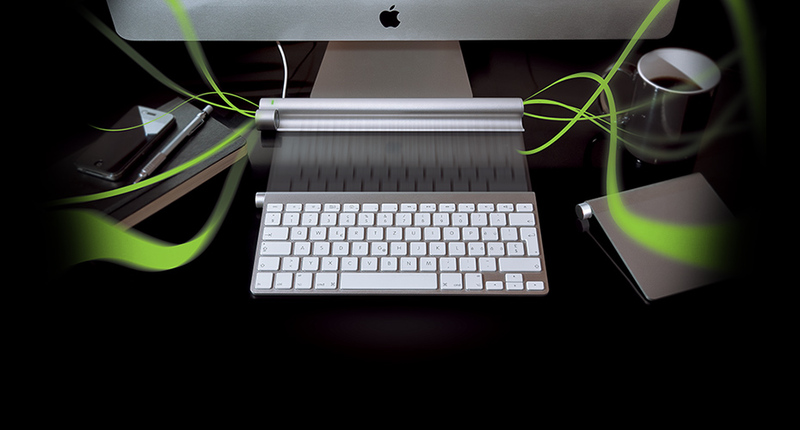 Simultaneously it can charge the Keyboard and Magic Mouse, or the Trackpad and Magic Mouse. All devices can continue to operate while being charged. The Magic Feet includes one cylindrical battery pack for either the Wireless Keyboard or the Magic Trackpad, and one battery pack for the Magic Mouse. The Magic Feet is A/C powered, charges the included battery packs wirelessly and also adds four USB ports for convenience. The Magic Feet ships early March and will be available at MSRP $149,90 (Ex. VAT) / 149,90 EUR (Incl. VAT).